The founder of Overhead Door Corporation’s, C. G. Johnson, invented the upward-lifting garage door in 1921 and the electric garage door opener in 1926. For almost a century, the Overhead Door brand has stood for product quality and expertise, as well as professional service. Overhead Door Company of Tulsa has been family owned and operated since 1962 and has become Northeastern Oklahoma’s preferred source for quality garage door products, service and installation. We are the largest Oklahoma distributor with a fleet of over forty service and installation vehicles. Our staff has more experience and product knowledge than any other distributor in Oklahoma. We have several team members that have worked for us for forty years. 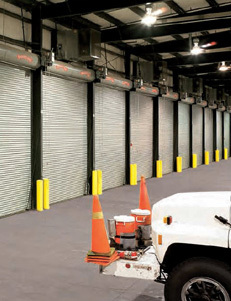 We have solutions for commercial and industrial overhead doors. Overhead Door Tulsa combines quality, dependable products with reliable service to consistently give business owners and contractors confidence and peace of mind. Please give us a call at 918-836-2546 to schedule a service call or free quotation.